Isaac Julien, Western Union: Small Boats (The Leopard), 2007. 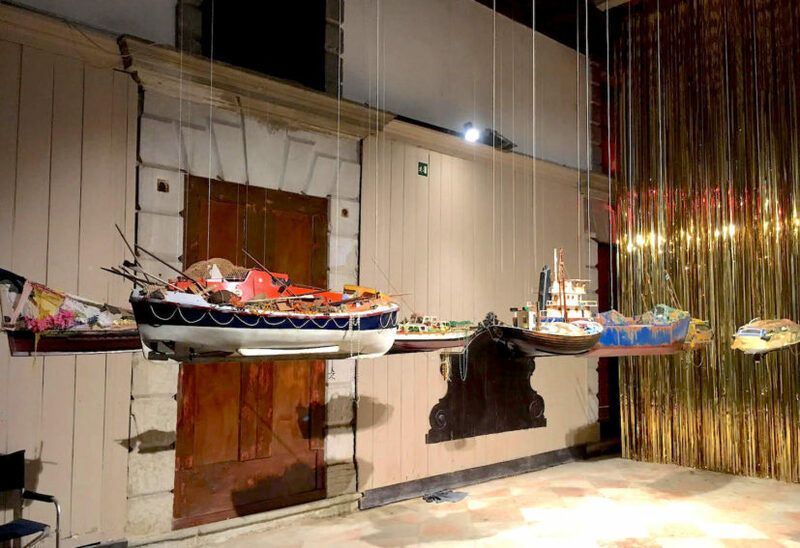 For more than a decade the Venice Biennale has resisted calls to abandon its national pavilions as organising principle, and adopt structures that more accurately reflect the realities of a globalised art world. There have been attempts by individual nations to undermine the notion of national representation. I think of Liam Gillick representing Germany in 2009, for example, or Nathaniel Mellors’ collaboration with Erkka Nissinen for the Finland pavilion this year. But generally speaking the focus on national representation has been adhered to in Venice as in no other biennale in the world. There is of course heavyweight symbolism in all of this. The established world order is mirrored by who is inside the Giardini – the old nations making exhibitions in distinctive, permanent pavilions maintained by their state – and those countries that came later to this world stage and rent spaces elsewhere in the city every two years. This year, in the wake of the American election, the shock of the UK referendum result, and the recent French election, the national symbolisms in Venice take on a new sharpness. The Diaspora Pavilion brings together a group of 19 British-based, ethnically diverse artists who, through the many narratives underpinning their work, speak eloquently of the infinite complexities of the very idea of nationality. Overwhelmingly one comes away with the profound sense of identity being constantly under construction, of the ongoing interrogation of heritage in relation to the individual, whether that be via ethnicity or intellectual and artistic commonality. 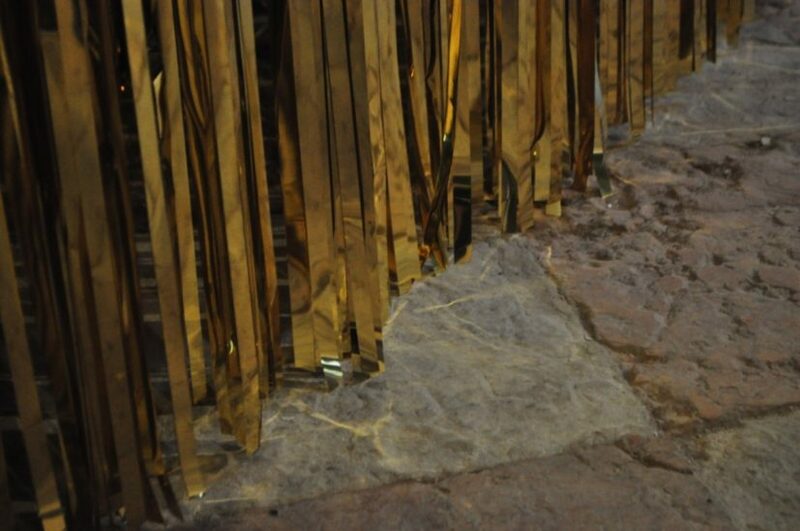 The opening gambit of the show is to make the visitor enter through the glorious golden foil curtains of a work by susan pui san lok. Her sound piece, formed of extracts from songs all with the word ‘gold’ plays you in and instantly everything else you have seen that day is forgotten. (pui san lok has installed another golden curtain and sound piece in the bathroom on the first floor). 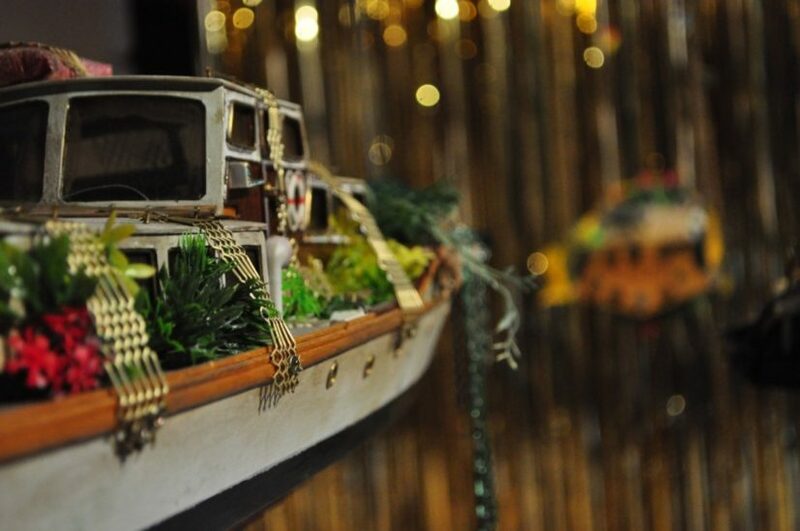 In the centre of the ground floor space is a new work by Hew Locke – a small flotilla of model boats decked out as if for a carnival – and beyond that an installation by Erika Tan based on Malaysian fishing structures that houses a screen showing extracts of four of her film works. 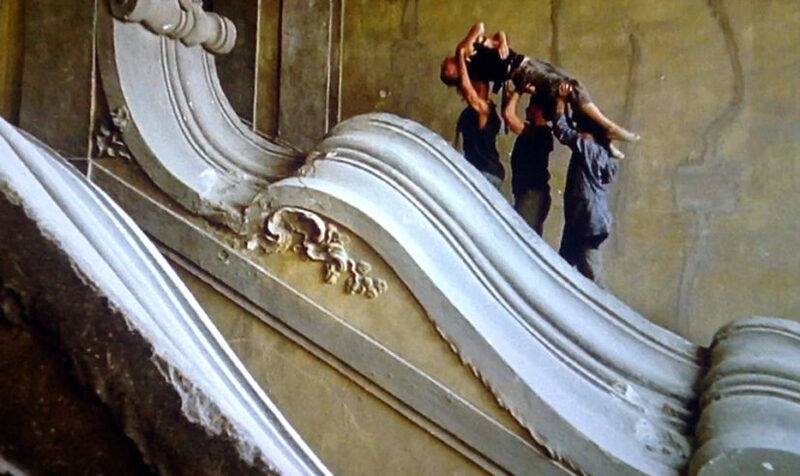 The staircase to the first floor is shared by Libita Clayton, Barbara Walker and Barby Asante. Libita Clayton has clad the stairs and wrapped a wooden ‘boulder’ in industrial grade black rubber. She explained to me that her choice of material was not only for its historical association with trade, industry and waste, but also for its metaphorical properties: “it can float, be resistant, have strength”. Her installation includes a sound work made with the Black British Classical Foundation. 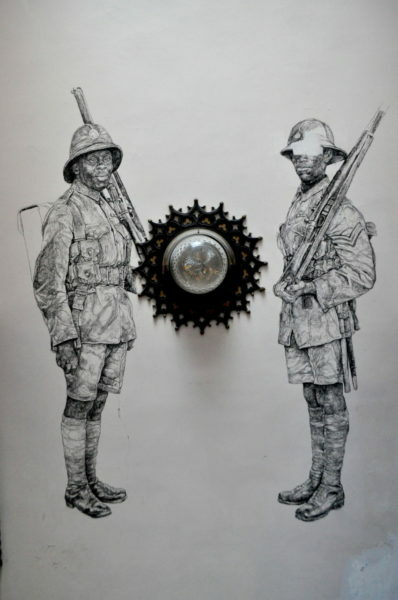 On the walls of the stairwell are charcoal drawings based on photographs of volunteer soldiers of the British West India Regiment during the First World War. Barbara Walker uses these images to unearth the story of the regiment that came to fight in Europe with the allies only to find themselves posted to Italy and tasked with a menial supporting role. Denied the right to fight as equals alongside white soldiers the regiment rebelled. One of the things that is extraordinary and so admirable about the Diaspora Pavilion is the way it is structured as a project. In 2016 the International Curators Forum, lead by David A. Bailey, put out an open call for young and emerging British artists of diverse backgrounds. The offer to them included not only an exhibition at the Venice Biennale, but a 22 month programme of mentoring and support by a group of high profile artists of international reputation. As one of the mentor artists, Isaac Julien remarked to me that his experience of art school in the 80s was of a group of students notably diverse in terms of both class and ethnicity, and free of the financial pressures that are faced by today’s generation. The Diaspora Pavilion project is an exemplary intervention into the professional lives of 12 young and emerging artists. Co-curated by Jessica Taylor and David A. Bailey, the project has offered support and guidance as well as an unparalleled platform in which to showcase their work alongside well known figures such as Julien himself, Sokari Douglas Camp and Yinka Shonibare. Barby Asante has contributed performance as well as installation and film, evoking touchstone figures in her life: a bedspread bears the image of a magnificent Ghanaian woman from the turn of the last century that stands in for the grandmother she never knew. Joy Gregory’s golden wall-based work also lists figures who have played a role in her life – I noticed the late MP Jo Cox among them. 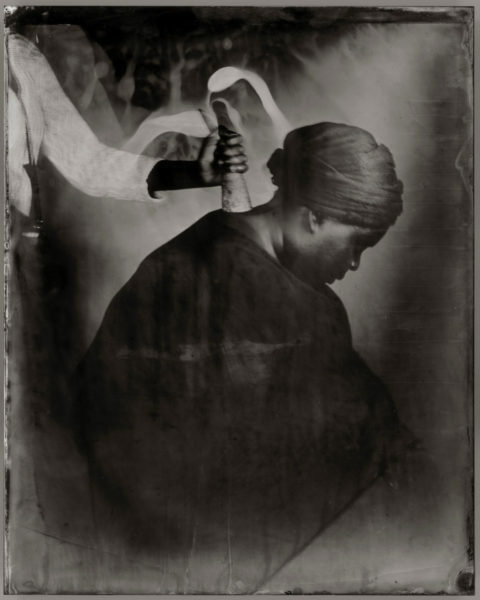 A wonderful group of dark, tintype photographs by Khadija Saye are self-portraits in which the artist is pictured with objects that formed part of her Gambian mother’s daily rituals. They are wonderfully strange images, bearing heavy emotional freight. Larry Achiampong’s film Sunday’s Best, 2016 recalls his experience of Christian worship growing up in the UK, tracing the effect of Christian imperialism on his own tribe, the Ashanti. He describes the shock of a first visit to a traditional English church, with its ornament and formality, after the vibrant form of worship in a community hall in south London. 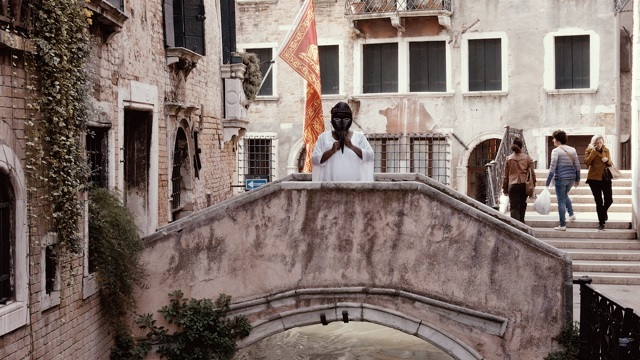 Dave Lewis’ photographs imagine his father as a visitor to Venice – an elegant young man, jacket slung over his shoulder, gazing over a bridge. These are images that beg questions about belonging and place. 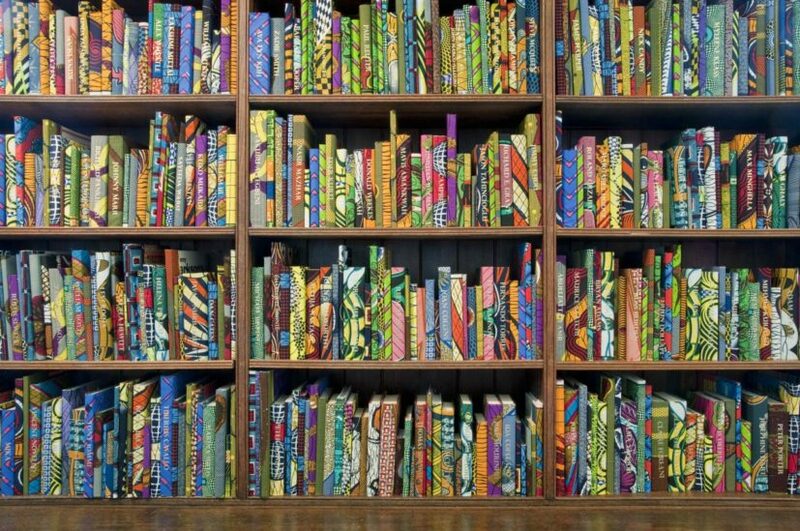 Yinka Shonibare is represented with a work from 2014 called British Library – a book lined room in which every volume is bound in Shonibare’s signature batik fabric. Embossed in gold on the spine of each book is a single name, an immigrant to the UK. Individuals are included who have made great contributions to British culture as well as those who have been opponents of immigration. Set aside a good hour or two to see this very smart, richly dense and involving exhibition. Alongside those names you know are people whose names will surely become much more familiar over coming years.